The rod and reel combo we recommend for deep water blackfish (tautog) should be capable of handling 50lb braid. The rod should be 6’6″-7″ with a fast to extra-fast action. We prefer a rod that has a little more beef to the rod to muscle the fish away from the structure. This is a very versatile conventional outfit and is perfect for choice for blackfish when using sinker weights up to 16 ounces. Levelwind reels are certainly easier to use, but may present a handicap when dropping the bait down in fast currents (because the line goes out more slowly). Do not be confused by the suggested lure weights specified on the rod blanks. These weights pertain to the size of lures that can be cast effectively using that rod. The reel should be loaded with 50lb braid. The heavier braid is preferred when fishing bouncing sinkers up to 16oz on the bottom. It also allows the angler to put enough pressure on the fish and stop it from wedging itself into rocks or rubbing the line against structure. Since braided lines have a thinner diameter and less water resistance, they provide an added advantage and allow the angler to hold bottom with lighter sinkers. The lack of stretch transmits even the softest of hits back to the angler. The rig we recommend consists of a 4ft length of 50lb fluorocarbon leader attached to the main line using a 75lb barrel swivel. A perfection loop is tied to the end of the leader and passed through the eye of a 4-16oz bank sinker. The long leader is required so that the braid does not rub against the structure. Fluorocarbon is required because blackfish can be notoriously line-shy. When this occurs some anglers reduce their leader size to 30lb. A dropper loop is added 6″ above the perfection loop. This dropper loop will be used to attach the leader and hook. A 3/0- 4/0 offset octopus (beak) style hook is snelled onto the end of the leader 9″ length of 50lb fluorocarbon leader. The snell ensures the hook is directly in line with the leader and gives the angler the best chance of setting the hook. A perfection loop is tied onto the other end of the leader. The leader is attached to the dropper loop on the main line by passing the loop through the eye of leader and then passing the hook through the loop. When fishing for blackfish on structure, it is critical that the angler frequently checks the hook point to make sure that it has not been dulled by the structure. As many other northeast species are either gone or starting to wind down, along comes the fall blackfish season. Water temps are really dropping and as the season opens the first fish are usually caught on structure in the 25 to 35ft depths. As the season progressives these fish move to structure in deeper water. As there is much more shallow water structure as opposed to deep structure, as the fish move they become more concentrated on fewer pieces of bottom and the bite just keeps getting better. In the spring, when the fish are spawning, they can be found in water as little as 4-6ft in depth and there is so much structure in these depths that the fish are typically scattered over large areas and it can be almost impossible to duplicate the fall action. Rock piles, wrecks, and submerged reefs provide the best fall action. Blackfish are feeding heavily and putting on weight to get them through the winter months. Crabs, worms, shellfish and other reef dwellers comprise most of their diet. All an angler needs to know is the depths and general areas that are producing fish. Once in those areas, even a modest fish finder can be used to find the structure. Don’t waste time trying to locate the fish, Blackfish themselves will rarely show up even on the most powerful sonar units. Spend a little time and search the bottom to find the more isolated and pronounced chunks of structure. The fish will be much more concentrated and easier to hold on the more isolated pieces. The more pronounced the structure, the more forage it will support, and the more blackfish that will reside on it. A good GPS can be used to save the coordinates of these spots for future trips. Shore ranges can also be used to return to these prime pieces of bottom. Blackfish pros carefully guard the locations of their favorite spots. As the deeper structure typically provides some of the best action (when the fish finally move to it), these spots are even more carefully guarded. When the fishing is slow, investing some time in locating good blackfish structure can pay big dividends later in the year. As with most reef and wreck fishing, anchoring is critical. Marker buoys can be used to pinpoint the most attractive piece of the structure. It is a good idea to have several markers at hand while preparing to anchor. Often a marker will be dropped and an even better piece will be found while preparing to anchor. Simply drop another marker and use that one instead. Even though they are rare occasions where one anchor will be adequate, it is almost always a good idea to double anchor. Conflicting and wind and current conditions make it nearly impossible to keep the boat positioned on a productive piece of bottom. By using both a bow and stern anchor the boat can be kept in the same position regardless of changes in either the wind or currents. By adjusting the amount of scope on the anchors the boat can be repositioned over different parts of the structure. Be sure to have ample line on both anchors as well as buoys on any bitter ends that are not tied off. A good conventional reel on a medium to heavy rod is best. Select a reel that can handle 30/50lb braided line. The rod should have enough beef to handle sinker weights up to 16oz, yet must have a sensitive enough tip to feel the subtler tog bites. Blackfish are notorious for darting into crevasses and wedging in, the heavier tackle will enable the angler to get them off the bottom quickly and keep them off. Braided lines provide an extra advantage. The thinner diameters and less water resistance allow for the use of lighter sinkers. The lack of stretch allows the angler to feel every bite and every change in the bottom. It also allows the angler to pull the hook out of hard baits and into the very tough mouths of the blackfish. There are almost as many different rigs as there are fishermen. A simple and effective rig consists of a 4ft length of 50lb fluorocarbon attached via swivel to the main line. A standoff or dropper loop six inches above the sinker is attached to a 9-12 inch 50lb leader tipped with a single 3/0-4/0 offset octopus (beak) style hook. Hook sizes and style vary depending upon the bait being used and personal preference. It is critical to constantly check the hook to ensure that it is still sharp as it is very easy to lose the hook point as it rubs against the rocks. Multiple hook rigs are not recommended. Most of the best bottom will be very sticky. Nothing is worse than hooking a good fish and having the free hook get hung up. In the shallower depths a sinker of as little as 3 ounces can be used to hold bottom. However, as depth and current increase heavier sinkers must be used. The sinker must be heavy enough to hold the bottom at all times and to give the angler enough feel when attempting to determine the composition of the bottom. Some anglers use a short length of lighter mono to attach the sinker. This is known as a breakaway rig and can be useful in areas where once stuck, the sinker is rarely freed. However, in many cases the stuck sinker can be freed with a little care and patience. In these areas a breakaway rig would result in an excessive loss of lead and lots of re-rigging time. Blackfish can be caught on an incredible variety of baits. Blackfish pros are continually discussing the fine points of various bait choices. The most effective baits in the fall are the hard baits, especially crabs. There are many types of crabs that can be used, Greens, Fiddlers, Ghosts, Asians, etc. Though local availability often is the deciding factor, everyone seems to have his or her personal favorite. Hard baits are a good choice as much of the structure in the fall also holds pesky bergals and other species that will steal soft bait. Blackfish can be finicky at times and when possible having a second bait choice can make the difference between a pick and some very hot action. However, switching from one bait to another will often cause the fish to ignore the other bait and all anglers on the boat will have to switch to the new bait. Chumming with clams or mussels can often have the same effect and is usually not necessary due to the isolated nature of structure being fished. An easy way to get some scent in the water is to use either cut pieces of larger crabs or by cracking the shell of smaller crabs. Once the fish start chewing on your baits enough scent will be released to keep their attention. The size of the bait being presented should be varied. There are times when large whole baits work best and other times where only the smallest pieces will work. If the fish seem to be tentative, it is a good time to scale down the bait. Small crabs can be fished whole either with our without their claws. The hook should always be placed with the least amount of damage to the bait. One way is to have the hook enter through the base of a claw and have the point just exit through one of the legs on the same side. Once the sinker has hit the bottom, a gentle lift and drop can be used to determine its composition. Continue lifting and moving the sinker until hard bottom is located. Hard bottom will often have a crunchy and broken feel to it. The more crunchy and broken, the more productive it will be. Once good bottom located a couple of more bounces can be used to determine the size and height of the piece. This method should be used repeatedly until a complete mental image of the bottom topography has been established. 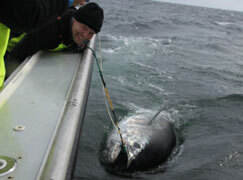 Flipping the sinker a few feet from the boat can also aid in the search for good bottom. However, casting too far and dragging the bait back across the bottom will greatly increase the chance of being hung up. Once a mental map of the bottom has been established it is time to settle down and hold the bait steady. The sinker must rest completely on the bottom and there should be just the slightest slack in the line. You will be able to feel the hit right through the slack if you allow the line to pass through the thumb and forefinger of your left hand. Blackfish can be extremely wary and will often take an exploratory nip at the bait (be patient). If they feel too much resistance, they may quickly lose interest. 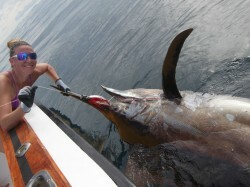 The rod tip should be held low so that there is ample room to both strike the fish and lift it away from the structure. If the action is slow wait at least a minute or two before moving the bait. If the action is hot and a minute goes by without a touch, move the bait, it is probably in a position inaccessible to the fish. A couple of repeated tugs or a continuing pull is the signal to set the hook (this takes some practice). 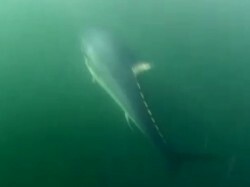 The depth and the nature of a blackfish bite means that not every hook set will be successful. If the bait is stolen, drop a fresh bait back to the same spot and try again. If a fish is hooked and landed, also drop back to the same spot. 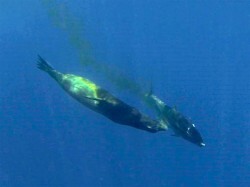 Often a single location on the bottom will produce fish repeatedly. As the fish are crunching the baits, scent is getting into the water and more fish are being attracted to that spot and a feeding station is created. This is another reason why it is so important to ensure that the boat is not changing its position. The Blackfish pros attribute much of their success to a combination of various skills. They use their sonar units to find and explore new potential hot spots. They use their navigation abilities to return to the best spots at the right times during the season. They are adept at identifying and anchoring directly over the most productive pieces of bottom. 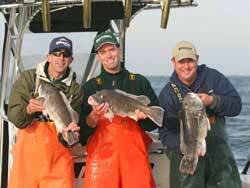 They are quick to adjust their bait choices and presentations depending upon the behavior of the fish. They know what spots produce better or worse during particular tides. All of these valuable skills can be used in the pursuit of many other species. Spending time in pursuit of these feisty fish will improve any angler’s abilities and make him or her a much better all around fisherman.